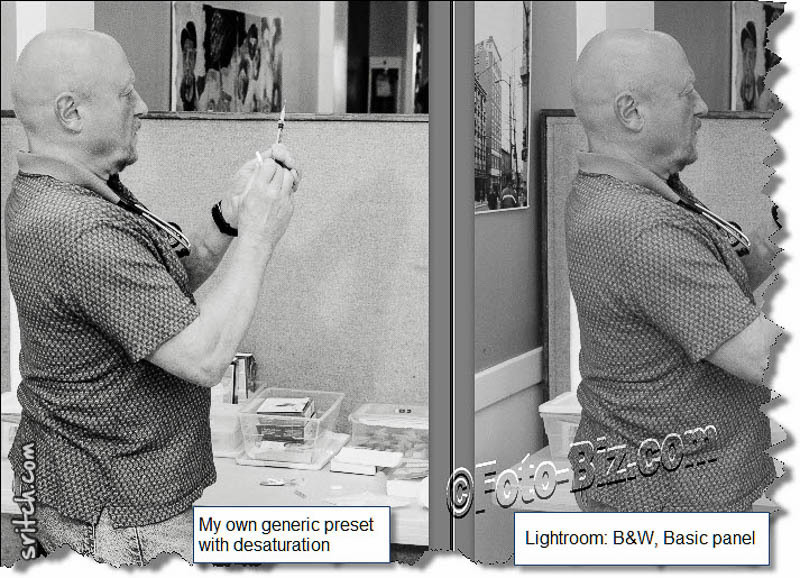 Lightroom has the treatment Color and Black & White in the Basic section. By selecting the Black & White, I only get “mush”. I don’t get any blacks and the only whites that I get are in the burned out skies. Here’s my way of getting “real” black and whites. Create a virtual copy, you will need it later for fine tuning the black and whites. Set everything to 0, actually instead of doing by hand, I created a preset that zeros everything. The camera calibration values are for modern Canon dSLR cameras. For everybody else Nikon, Sony… you can use this as a starting point. I’ve created a small preset with these values by clicking the on the + to the right of the Presets. Then, just one click on the preset and it’s already quite good. Now comes the time for the finishing touch. That’s when the virtual copy comes in. I keep the virtual copy for the reference, so I can see how the colors have converted to black and whites. Select the HSL / Color / B & W section by clicking the B & W.
At the top left corner of that section, there’s a little circle with an ↑ and a ↓, click on it. You can move your mouse to the black and white image, click once somewhere on the image then you can use the scroll wheel to make a color lighter or darker. That’s where the virtual copy come in play, it allows me to know what are the blues, the reds, the greens or any other color, so I can adjust them individually.